First of all, we should not let well alone. It usually means that something’s being covered up in the interests of the colonial powers. There is, after all, something called “history written by the victims.” The first item of my manifesto is: don’t let well alone. Secondly, we must listen out for murmurs, hints, quiet echoes. We should watch out for doubles, and for deja vu. There are very few direct paths for a ghost to go down, especially if it’s locked away in a crypt somewhere, behind thick walls and a keyless door. This means that communication is likely to be roundabout, enigmatic, elusive and transient. We must treasure this communication if it chooses to go through us, and enjoy the shivering that it causes. Thirdly, we should seek out ceremonies of reparation, rituals of recovery. We will know their insufficiency, but acknowledge that engaging in them will be all we can do. Understand that if a ghost keeps troubling you, it may mean that you have missed the point. But it also might mean that you’re the only hope that the ghost has left. And finally, we must recognize that we are ghosts, too. There is little distinction between the haunted and one who haunts, the former turns into the latter, soon enough. Perhaps our capacity to recognize ghosts is what determines the likelihood that we too will be recognized in our struggle to be heard and seen. It’s not obvious that there is any other way to do it. Posted by WorldbyStorm in Culture, Economy, European Politics, Irish Politics, The Left. 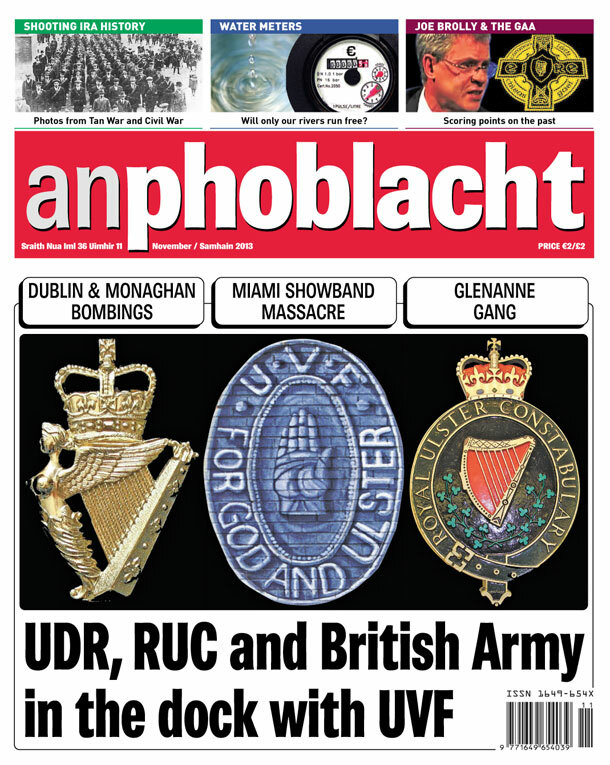 The November edition of An Phoblacht is just rolling off the press and will be in your local newsagent nationwide from Friday morning. Water meters: Will only our rivers run free? This is a reminder that we have debate and meeting on Saturday the 2nd of November starting at 10.30. Come for part or all of the day. Hope to see you there! 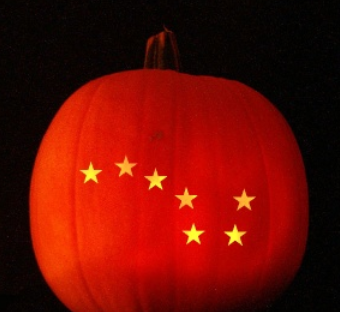 …announcements from the Sheriff’s Secret Police, mysterious lights in the night sky, dark hooded figures with unknowable powers, and cultural events. If you’re into this kind of stuff, then the podcast/story/weirdness of Welcome to Night Vale will probably appeal. If not it won’t. I kind of love it. Not least for the ads and the part in episode three where the narrator has to (gulp) find out whether the unseen ‘management’ at the radio station he broadcasts from in Night Vale are willing to renew his contract. A situation that has deeper implications than it might seem at first sight. It also strikes me as being… well, more than a little political with a neatly sardonic/cynical line about US democracy and various other contemporary issues that it touches on deftly with no hammering home of obvious messages. Not to harp on about the curious ‘dependency=healthcare’ SBP piece from a short while back, but the publication of a survey by the UK Children’s Society suggests that many of those children growing up in poverty are well aware of their and their families situation. Of those children surveyed who said their family was “not well off at all”, 76% said they “often worried” about how much money the family had. More than 53% said their home was too cold last winter and 24% said it was “much colder” than they would have liked, while 26% said their home suffered from damp or mould. A separate survey published on Tuesday shows that greater numbers of disadvantaged families are using the services offered by local children’s centres, despite continuing local government funding cuts. The research published by the charity 4Children, which runs family and children’s services across Britain, revealed that although 73% of children’s centres say they worked with an increasing number of families over the past 12 months, 66% are operating on a decreased budget compared with the previous year. About a third expect to be able to provide fewer services in a year’s time. In a way the issue of child poverty, or poverty which affects children, is particularly interesting in the way it plays out ideologically and politically. Unlike other areas of poverty it is more difficult for right critiques to default to ‘blame’ as so often occurs either implicitly or explicitly – as with unemployment, etc, and yet it also functions as an example of just how much is contingent in a society driven by markets and marketisation. I wonder is that one of the reasons we are seeing little hints and nudges about supposed genetic bases for intelligence and ‘talent’ and why that must be factored into public policy on education and so on. Because those latter arguments are highly expedient if one wishes to divide the world up into those who are ‘successful’ and those who are not and to afford some sort of agency to the former and remove it from the latter. But really, child poverty points up that previously mentioned contingency. One has no choice as to the family one is born into, that is pure random chance. Societal and economic structures which prolong, extend and exacerbate poverty impact upon the individual and the collective in such cases, and yet given the relative shortness of life-spans and the difficulties of surmounting familial circumstances child poverty points up the necessity for wholesale refashioning of the broader socio-economic context. And let’s not forget how this feeds straight into issues of social mobility. Milburn challenges the weak incrementalism of both the coalition and Labour in power. This electoral dynamite shows not just the poor, but middling children doing worse than their parents: few good jobs, no homes and heavy debt. Most people, right or left, would be alarmed at a trajectory of ever-worsening inequality. But few know the facts, wildly underestimating widening wealth gaps, still thinking Britain quite meritocratic. This ends the myth of modern classlessness, exposing shrinking mobility. The ladder up is so high and steep few can climb it – while those at the top exert all their power to stop their children falling down. All parties praise equality of opportunity, but afraid of overt redistribution they rely on schools to bear the weight of reversing tidal waves of social difference. The report will show how the more equal a society, the less a child’s background predicts future success – Labour had already started to loosen the link between GCSEs and social class. …a 250-page radical tome from Dominic Cummings, Michael Gove’s charismatically influential adviser. Ranging over a wide horizon, he lays into every element of education. But the eyecatcher is his section on genetics, implying human fate is sealed at birth, as the Calvinists and eugenicists thought. Are brain, brawn, sin and virtue preordained; the elect predestined for high things? “There is strong resistance across the political spectrum to accepting scientific evidence on genetics. Most of those that now dominate discussions on issues such as social mobility entirely ignore genetics and therefore their arguments are at best misleading and often worthless.” He claims research shows that as much as 70% of a child’s performance is genetically derived. Toynbee did something very basic, very elementary, very sensible. She went and asked a geneticist what he thought about this ‘Professor Steve Jones, the celebrated geneticist at University College London’. Which is, in all these matters, perhaps the intelligent, and most certainly the logical thing to do. What are Jone’s thoughts on this matter? Cummings, using the work of the behavioural geneticist Robert Plomin, badly misinterprets it, says Jones, and “fundamentally misunderstands” how biology works. That 70% is, crucially, “a statement about populations, not individuals. It certainly does not mean that seven-tenths of every child’s talents reside in the double helix.” Teachers become more, not less, important, Jones says, when examining the close interaction of environment and genes. Even in the simple matter of height, environment plays its part: with no DNA change, his native Welsh population has grown two inches and increased its IQ since the 1950s. Moving to affluence increases a working class child’s IQ by 15 points. “The more we learn about genes, the more important the environment appears to be.” Plomin spent years scanning top children for success genes, but never found them, says Jones. In life, “success and failure depend far more on the economic than the genetic accidents of birth”. Wealth is considerably more heritable than genes. The most equal nations with the best Gini ratings score the highest average intelligence. Now we as leftists or Marxists (and sometimes both – nah, my little joke) know this almost intuitively. Economics isn’t everything, but it inflects everything to varying degrees. Of course the economic will have a greater influence than the genetic. How could it be otherwise. As I noted in the previous piece on this subject given the change in class structures across centuries where small elites were subsumed into broader classes and where class position changed (consider that in relation to say Ireland between 1800 and 2000, which is a blink in the eye in terms of human history) it is clear that any fixed notion of upper class=intelligence/talent is absurd. And as to that political import? As Toynbee notes, ‘Cummings is shockingly dismissive of early years investment’. Of course he can be. If you believe that those who are in the middle and upper class are there by dint of talent then you are naturally going to believe that there is little to be done about those who aren’t by your lights talented. And yet this goes against all best practice whether in Europe or more widely afield. Indeed, and this is the contradiction at the heart of this, state after state globally is investing massive resources in its young with obvious results. Teach a child, any child, and overwhelmingly the evidence is that they will develop positively. Recently I heard a Tory MP praise the 11-plus for “picking diamonds from the rough”. Genetic thinking created the 11-plus, Prof Jones says, designed “with almost no evidence” and no good results. Policymakers who misuse genetics to argue that a child’s fate is all-but preordained may stop investing in “no-hopers”. David Cameron set up this commission, but why would a government bother about inequality if failure is irreversibly stamped on some people? My mother trained as a teacher in the UK. She once heard at a lecture, and this would have been in the late 1950s, one fairly famous conservative British educationalist arguing in an unguarded moment that the big mistake was general education for all at secondary level on foot of the 1944 Education Act, articulating a sense that for many there was no point in educating them beyond a certain level. Almost needless to remark he wasn’t talking about the offspring of the middle classes. That attitude continues to exist even if it is dressed up in different clothing. And circling back to child poverty that too is of central importance in all this, not merely in and of itself as something that must be ameliorated but what it represents in terms of the failure of this socio-economic system. Jobless figures to be released today will show the total number of people on the Live Register has dropped below 400,000 for the first time in more than four years. The figures from the Central Statistics Office are expected to show a drop of more than 10,000 people claiming jobseeker’s allowance since last month. The main findings on party support are: Fine Gael are at 29%, up two points, Labour are at 9%, down one point, Fianna Fáil are unchanged at 23%, Sinn Féin are also unchanged at 17%, while Independents and Others are down one point to 22%. And on foot of that Adrian Kavanagh’s prediction for seats is FG 57, FF 45, Other 25, SF 22, LP 9. Predictions predictions. So let’s assume that they come with significant health warnings, even if the broad dynamics seem about right, with FG still in a sort of comfort zone, but languishing sub-30, Fianna Fáil unable to break above the mid-20s, Labour in parlous state and Sinn Féin consolidated at the higher end of the teens. Others and Independents remain strong. It’s too early to argue that this is the environment that will be extant in the direct run up to the next elections, but, one does have to wonder if FG will bleed any serious support, or whether FF can increase its support above that mid-20s figure. I think that for Labour the show is over. 9% is no disaster compared to previous electoral outings, but 9 LP TDs in a Dáil where potentially SF will have three times that number is deeply problematic, not least because SF appears to be able to capitalise on a broader (if more diffuse) vote. It still remains curious just how oblivious or indifferent the LP leadership appears to be to all this. Surely they can’t believe that a grateful electorate will reward them if there are small shoots of growth? This year, despite some early signs of improvement in the economy and gains in consumer confidence, the coalition as yet does not appear to be reaping any rewards for this. In fact, the proportion of voters that trust Fine Gael and Labour with the economy has declined in the past year. It currently stands at just over a third of voters (36 per cent), down 2 points from a year ago. This supposed relationship between economic improvement and electoral reward is massively overstated to my mind. As noted many times previously, one need only look at 1997 to see how that simply didn’t function in any meaningful way for the outgoing FG/LP/DL coalition. Why it should in 2015/16 escapes me. Granted the chaotic aspect of the electoral map with large chunks of support floating free of parties perhaps gives them hope, but the clue appears to be in the ‘floating free of parties’. That support seems quite happy to give their preferences to Independents and Others and with little or no inclination to return to former political homes. That said perhaps the LP leadership are beyond caring at this stage. Of course in their journey to this point there is a lesson of electoral volatility, and just how the Irish electorate is willing to switch and with extreme rapidity between options. But it’s not all about Labour, indeed if the poll ratings are correct, or if they worsen for that party, it may not be about them at all. Truth is the real contest is that between FF and SF and FG. Not that I expect SF to be competing directly against FG, but it is clear that it looks well set to take over the LP slot in the Irish political system. 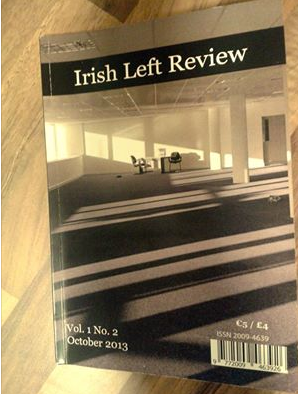 That raises many many interesting questions, some about coalition building, others about where SF will sit on the spectrum, and indeed about the pressures on that party in relation to shifting further to the centre of Irish politics or whether it will be able to maintain a sort of social democratic line. As to the Independents/Others vote, a dip of 1% is probably as meaningful as the 2% increase for Fine Gael, which is to say not very. Its very existence as a block of voting support is remarkable. There’s a fair bit of stuff about how the increase in support in Dublin for them represents a sort of Creighton by proxy ex-FG, now Independent leaning vote. Perhaps, or perhaps that represents a dislocation with FG for broader reasons. Difficult to tell until we actually have a vote, but one way or another and moving towards three years into this government the consistency of that support is remarkable in and of itself. It is a factor that threatens to upset any predictions and calculations as to electoral outcomes. Though if forced I think it is likely that an FG/FF combination is moving closer to reality. Would they, could they, do it? Perhaps if a large cohort of Independents/Others and a significant SF presence is in the Dáil no doubt the electorate will be regaled with stuff about the ‘danger’ of instability and so on. It’s not hard to write the lines. And two parties will do what is expected of them. Still, there are other options, FF/SF/LP on some days wouldn’t be an impossible stretch. And so on. But I’d almost bet that there will be a deep aversion to dealing with Independents, for fear of encouraging them, so to speak. Small wonder we keep hearing about that new ‘right’ party. No end of egos who would want to be in on the inside track if the opportunity arose. That alone might make it more rather than less likely for such a formation to coalesce. Some very interesting thoughts expressed here too in comments. 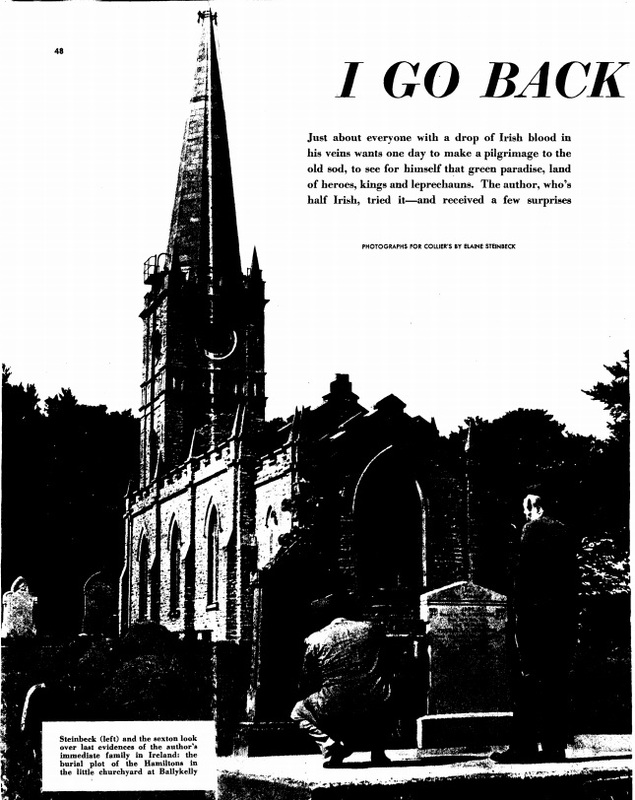 Stumbled across this article from 1953 by John Steinbeck where he describes visiting Ireland/ Derry to see where his ancestors hailed from. Was sent this today, Junior Minister Alan Kelly advertising clinics in Thurles.